Subramanian Swamy now wants Arvind Subramanian, one of the front runners for the post of the new RBI governor to be sacked. After targeting RBI Governor Raghuram Rajan, BJP leader Subramanian Swamy has now trained his guns on Chief Economic Adviser Arvind Subramanian and demanded his sacking. "Who said to US Cong on 13/3/13 the US should act against India to defend US Pharmaceuticals interests? Arvind Subramanian MoF !! Sack him!! !," he tweeted. Swamy's attack comes in the wake of reports of Arvind Subramanian being among the probable successors of Rajan as the country's central bank chief. "Guess who encouraged Congi to become rigid on GST clauses? 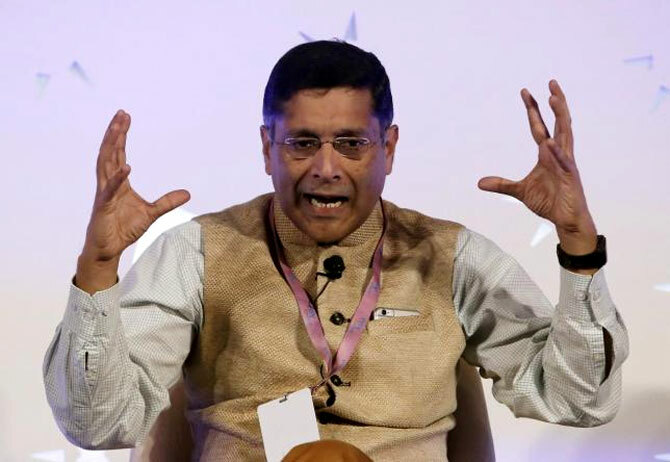 Jaitley's economic adviser Arvind Subramanian of Washington DC," Swamy tweeted, saying he is "helping Jaitely to recognise the enemies in our camp". In a series of tweets attacking the chief economic adviser, who is an NRI, he said, "Now PTs (Patriotic Tweeples) can understand why our core economic sectors could not perform last two years. Trojan horses galore in MoF/Fin Institutions." "Was AS (Arvind Subramanian) deposing before US Cong Committee against India as a US citizen or Indian? Does any PT know?," he asked. Arun Jaitley and asked whether Prime Minister Narendra Modi is handing over Finance Ministry to Swamy. "Subramanian Swamy now guns for Arvind Subramanian Economic Advisor to NDA. Target is Arun Jaitley not Arvind Subramanian. "He has been claiming that PM has assured him as quid pro quo if he targeted Nehru Gandhi family," Singh said in a series of tweets. Swamy had earlier launched a scathing attack on Rajan, who announced last week that he would return to academics after his current tenure as RBI Governor ends on September 4. Swamy had attacked Rajan, saying he is 'unfit' for the job and is 'mentally not fully Indian'. Incidentally, both Rajan and Arvind Subramanian have worked at the IMF. While Rajan was a UPA appointee, Arvind Subramanian was appointed by the Narendra Modi government. In a communication to the Prime Minister’s Office, Swamy expressed his opposition to the Goods and Services Tax. Listing out the negative sides of GST, he is likely to abstain from voting in the Rajya Sabha. Earlier too, he had stated that GST is not a ‘game changer’ and it will not impact the economy significantly. As BJP leader Subramanian Swamy went after his new target Chief Economic Adviser Arvind Subramanian, Finance Ministry defended his appointment, saying it knew of his stance on key issues like IPR beforehand. The Finance Ministry knew of his stance on key issues like Intellectual Property Rights (IPR) before choosing him, they said adding the ministry was not giving credence to Swamy's remarks on Subrmananian. The BJP government had in October, 2014 appointed IIM-Ahmedabad alumnus Subramanian as CEA in the Finance Ministry.